Note: This guy’s face before surgery may freak some people out, so be aware before you watch this. I’m posting it because it’s amazing what medical science can do (the surgery lasted 25 hours!). I’ve put the full before and after pictures below the fold. Click “read more” to see Cameron before and after the surgery. The transformation is absolutely stunning. This entry was written by whyevolutionistrue and posted on December 4, 2018 at 2:30 pm and filed under medicine, medicine and health. Bookmark the permalink. Follow any comments here with the RSS feed for this post. Both comments and trackbacks are currently closed. I take it that’s his true expression on the right – very happy for him and his family. Amazing stuff. Can make any of your own health problems seem minor. There are always those out there who are much greater. Also, can’t imagine what the cost of something like this would be. Priceless I think. If I was to get a face transplant I think I’d go for a young George Clooney face. Problem is that requires a dead person with a young George Clooney face. Nat Geo. covered a face transplant quite extensively a couple issues ago. Subsequent to that there was a second one in Montreal. That one was free. Well no we all paid for it. Woa. That is amazing. I don’t know if the facial nerves will regenerate to restore movement. From reading around I gather that it is important that the motor nerves do eventually trigger facial muscle or life quality might be worse than doing without the transplant. Swallowing, eating, blinking for example. Some reconstructions haven’t gone well & the patient ends up having to be fed direct to the stomach. I suppose that the art is in choosing suitable patients who will benefit & who have the psychology to will themselves through the pain. And the lifetime regime of immunosuppressive drugs – a health hazard in themselves! 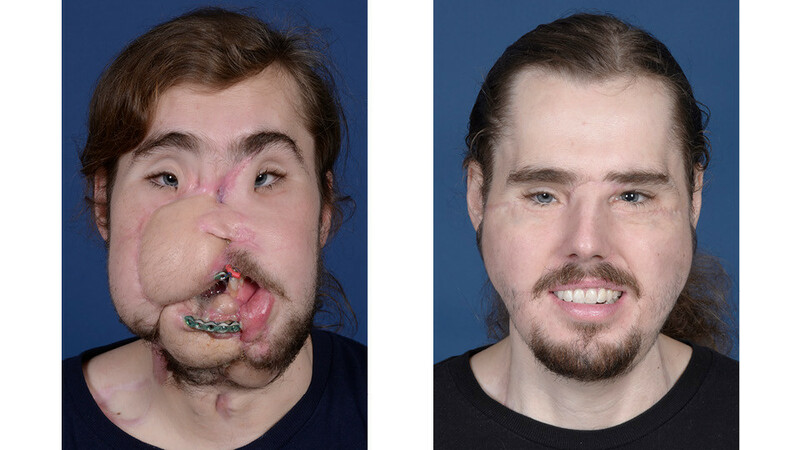 Just one of the four face transplant recipients underwent direct repair of the sensory nerves. In the other three cases, it was impossible to reconnect the nerves because of technical difficulties or the severity of the patient’s injuries. The study reports all four patients regained sensation in the transplanted face, starting as early as two weeks after surgery. By the end of the first year, all had normal or near-normal sensory function. The extent of recovery was similar to that achieved with simple repair of injured sensory nerves in the face-and even better than that of grafting procedures where tissues are transferred to the face from different areas of the body without reconnecting the nerves. Must take several types of specialist for this as well. It is more than just plastic surgery. This one large office in a medical center near me has one building called – Oral & Maxillofacial surgeons. I believe they do all kinds of dental procedures that would be involved with this. I saw this young woman’s similar situation. It was disturbing. It was interesting that the young woman said she had no thoughts of suicide, that the decision was impulsive. I’m guessing that may be a common thread in suicides, especially those of young people. That’s really fantastic. A new life. It occurs to me how strongly we are attached to our outer appearance. In this case, of coarse, there was an issue with function as well as appearance. From an evolutionary perspective, we are psychologically tied to face and eyes. I sometimes wonder though that despite a disfiguring injury or some other anomaly, a person is still the same inside. The mind is the same whether you are rivetingly attractive or horribly ugly. I remember a Twilight Zone episode which highlighted the relativity of appearance. On some planet in the Zone, the ugly are the beautiful and the beautiful are ugly. I don’t want to watch the video (I’m a bit squeamish when it comes to these things), but how does a 25 hour surgery work? Do they keep him under while the surgeons take breaks? I assume it’s not two or three different teams of surgeons working in shifts, but the same team the entire time. But it’s remarkable what they managed to do for this man. Seeing those pictures makes me so happy for him. He must have thought a normal life was a thing of the past. It’s wondrous. It’s more complex in some ways than a moonshot – the operation is planned weeks in advance & organised into stages just like building a house: different specialities at different stages of the [re]construction. THIS LINK IS WORTH A LOOK ~ it outlines the specialities for a 24.5 hr operation [theatre nurses not mentioned I noticed!]. Strangely enough the anaesthetist [& team] isn’t listed nor alluded to – the toughest job I reckon. You’ll note there’s nine surgeons with speciality expertise in plastic surgery along with two surgical assistants. HERE’S THE MAYO CLINIC’S page for prospective face transplant patients – daunting description of what to expect! Amazing. You did it again. Thanks! Yeah, I could have been more than happy to have never seen his face. But, the increasingly SJW BBC, who puts trigger warnings on damn near everything, decided that needed to right up there in their news app feed. I can handle a lot of gross stuff, but the mangled suicide faces…nope. Sickening, so much so that I struggle to have any empathy for them, which I am ashamed of but it really bothers me. It’s a visceral reaction and I wish it wasn’t , but thank you for a reasonable warning. I hope it works for him, and really, what an excellent argument against easing gun restrictions. But hell, when a handful of people get sick from lettuce, we must panic and clear it from our store shelves, but guns killing more people every single day by homicide, accidents, and suicides…nah. Lettuce is clearly the enemy. If this doesn’t make you bawl you’re stone! Amazing achievement! I hope that this will be a real fresh start for the patient. And, as always in such cases, I feel sad about the donor. That is pretty amazing, even spectacular! The first ever face transplant recipient was Charla Nash, the woman who was disfigured, blinded, and lost both her hands from a friend’s “pet” chimp attack. She gave an interview in 2016 and looked remarkably well.